This plant variety is one of the tallest and has the largest leaves of any type I have seen. 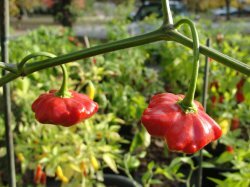 The peppers produced turn from green to red and are a unique starfish shape that makes it special. It's from Brazil and has a spicy flavor that is unique.